There was surprisingly little fanfare surrounding the announcement of Amazon's latest Fire tablets. Where last year's unveiling involved renting out an airplane hangar at the Santa Monica airport, the new tablet trio was quietly shown off to a small gathering of journalists at the company's Seattle headquarters. Asked why Amazon opted for something so low-key, a rep answered, that CEO Jeff Bezos "just likes to mix things up." (Those wacky billionaires.) Indeed, there was little rhyme or reason to the scaling back. After all, the new HDX tablets, available in 7- and 9-inch sizes, bring a number of key upgrades to the Kindle Fire line on both the hardware and software fronts. And that's a good thing: between the Nexus 7, iPad mini and a seemingly endless parade of pocket-sized tablets, Amazon has more competition to contend with than ever. But while the company's acknowledged that its tablets are basically just content delivery vessels, it's chosen to compete on specs as well, with a 1,920 x 1,200, 323-ppi display, a quad-core Snapdragon 800 processor and new software features that include baked-in video customer support and a "Second Screen" TV feature. So is that enough to keep the Kindle Fire competitive? 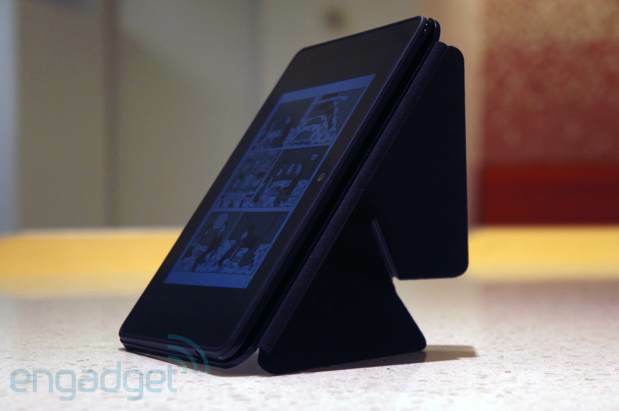 How would you rate the Kindle Fire HDX 7-inch? Those who've never been to Engadget HQ have never gazed upon our vast storage archives, full of strange, lost artifacts from forgotten eras, not unlike the final scene of Raiders of the Lost Ark. When the HDX arrived, we did some digging and happened upon the device's ancestor, a utilitarian rectangle from the prehistoric days of 2011 that looked to be birthed from the same assembly line as BlackBerry's first tablet. Amazon might make its money through selling content, (as Bezos told us last week, his company "make[s] money when people use our devices, not when they buy our devices"), but the company is keenly aware that being competitive in this arena requires cutting-edge specs and the occasional hardware rethink. At least as far as budget 7-inch tablets are concerned, Amazon's delivered here. 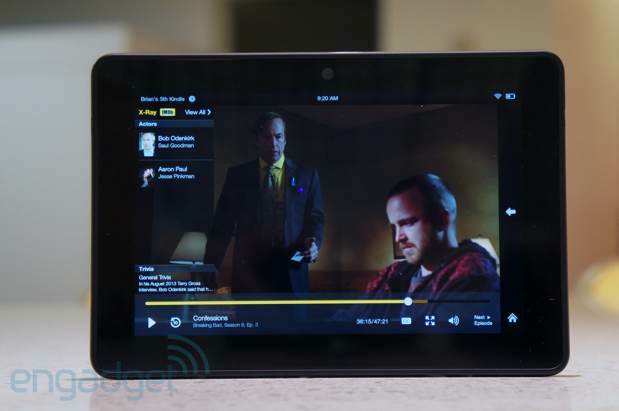 The Kindle Fire is looking fairly svelte this time around. Amazon's continued to shave a few more fractions of an inch from all dimensions. The 7-inch HDX comes in at 7.3 x 5.0 x 0.35 inches, down from 7.6 x 5.4 x 0.4 on last year's model. It's also noticeably shorter and just a touch thicker than the new Nexus 7, which measures 7.87 x 4.49 x 0.34 inches. The Fire's diminished waist size has helped it shed a few precious ounces as well, shrinking from 13.9 last year down to 10.7 for the WiFi-only version (that's 11 ounces on the 4G version). All told, then, assuming you get the WiFi model, it's just a little heavier than the Nexus 7, which weighs in at 10.2 ounces. It's light enough for those late-night Under the Dome marathons -- don't be ashamed, we're all friends here -- but still feels reassuringly solid. The display is glossy. Really glossy. Just try taking a picture of the thing outside without catching yourself in the shot. It's not easy. Believe us. Amazon lists "reduced glare" among the HDX's features, but the company also quickly points out that if you're looking for a device to do some reading on out by the pool, well, it's got this thing called the Paperwhite you might want to check out. Once again, there's a webcam front and center here. The company's not talking megapixels on this one, but it does say that the camera can shoot in 720p, just like its predecessor. That means it's sufficient for video calls (Skype is available through the Fire's app store), but it isn't ready to replace your point-and-shoot. Unlike the Nexus 7, which sports a 5-megapixel main camera, there's no rear-facing shooter here. For that kind of dual-camera action, you'll need to upgrade to the new 9-inch Fire. The HDX's body sort of splits the difference between its predecessors. It's not nearly as boxy as the first generation and it's not quite as rounded as the HD. The rear retains the soft-touch feel of its predecessor, with some slight angling along the edges. On the left is a big volume rocker and on the right is a large power button. The buttons feel solid and are big to save you some time when fumbling around in the dark to turn the tablet on. Along the top is a glossy black plastic band that houses a speaker grille on either side. Last time around, we questioned their placement on the middle of the back cover; you couldn't really avoid muffling the sound when holding the device. Amazon apparently listened to popular feedback: it moved them to the top, a spot that also makes sense with the optional Origami cover. Like the new Paperwhite, Amazon's ditched the subtler Kindle logo for the familiar Amazon "A to Z" in glossy black plastic, smack-dab in the middle of the back. We're fans of subtlety when it comes to device branding, but as we said in the Paperwhite review, the vast majority of the time the tablet's in use, the logo is going to be covered by your hand, a case or both. And hell, it's Amazon. We'd be surprised if it didn't use the available real estate as some sort of a billboard. Be thankful the company isn't advertising Fifty Shades of Grey back there. On the right side, you'll find the headphone jack, for those times when the rear-facing speakers aren't situation-appropriate. Believe us, no one else on your morning commute is quite as psyched about the new Sebadoh album as you are. Along the top, you'll see two centrally located holes that serve as the dual microphones, a key hardware element of the company's new Mayday software offering. More on that below. On the left side of the player is the micro-USB port -- not MHL, micro-USB. There's also no HDMI out. Again, the justification for that will be made clear in the software section of this review. There's no microSD slot, either -- though we don't have to wait for the software section to explain that. For starters, Amazon provides plenty of cloud-based storage for all of the content you buy through its site. Over the past few years, Amazon's cloud services have been a wholly integrated and essential leg of its device strategy. Also, the company's never been a particularly big fan of letting people side-load content onto its devices; it really, really wants you to get everything through its own storefront. And with a business model that doesn't actually pull in any revenue from hardware sales, can you blame Bezos and Company? There may be no expandable memory, but the Fire HDX certainly isn't lacking in internal options. The 16GB version will run you $229; the 32GB is $269; and the 64GB model is priced at $309. Those tiers all include Special Offers, the built-in advertising platform that helps Amazon subsidize the Fire's price even further. That pricing is on par with the base Nexus 7 and $20 more than the Fire HD. Shaking off Special Offers will cost you $15, and if you need internet access everywhere you go, you can expect to add $100 for a 4G model. That will be available from AT&T and, for the first time, Verizon. The 4G version can also be bundled in with AT&T's Mobile Share and Verizon's Share Everything plans for $10 a month. The processor, like just about everything else, has also gotten a refresh -- quite a big one, in fact. With the proper tools, or just a big hammer and a reckless disregard for the sanctity of Android tablets, you'll find a 2.2GHz quad-core Snapdragon 800 processor buried inside, a notable upgrade from last year's 1.2GHz dual-core chip. It's also got a bit more juice than the Nexus 7's 1.5GHz quad-core Qualcomm SoC. Unlike last year's RAM mystery, Amazon's also gotten in the habit of listing memory on its spec sheet -- not surprising, now that it's increased the allotment to 2GB. The company is also clearly making a play at the gaming market, with the addition of an Adreno 330 GPU, which promises four times the performance of the HD, according to the company. As mentioned earlier, Amazon gets points for moving the Fire's speakers up top, where the sound has much less chance of getting muffled. Like before, the sound is helped along by Dolby Digital Plus, though, as you'd imagine, you're not going to get theater-quality output on speakers this size. They get surprisingly loud and will work in a bind, but the sound is still a bit tinny, and turns muddy when things start to get loud. If you've got a Bluetooth speaker, now's the time to use it. The display is another story. Amazon once again upped its game, this time upgrading from 1,280 x 800 at 216 pixels per inch to 1,920 x 1,200 at 323 ppi, matching the Nexus 7's display pixel for pixel and leaving the iPad mini's 1,024 x 768, 163-ppi screen in the dust. Indeed, it's a beautiful thing to behold, and it makes us seriously consider upgrading our Breaking Bad digital collection to the HD format. If we're going to relive the trauma, we would want to view Walt's meth in the true blue that only perfect color accuracy can provide. In outdoor use, the dynamic image contrast helps as well, utilizing the built-in ambient light sensor to adjust the contrast of the display on a pixel-by-pixel basis, rather than just changing the display brightness. The effect is generally subtle, and you won't often see it kick into action. In a demo, an Amazon rep shone a "sunlight" flashlight on the sensor indoors, and the result was immediate and impressive. So you can do that at home, if you really want to see a dramatic transformation. The display and rear camera aside, the 7-inch HDX's hardware is quite similar the 9-incher's. In brief, Amazon didn't skimp on the horsepower here, which means we've got a pretty powerful little device on our hands. The usual Kindle carousel moves quite smoothly and apps load quickly. Gaming has also taken several steps in the right direction. A quick lap around the track with EA's Real Racing 3 yields some impressive results for a budget device. 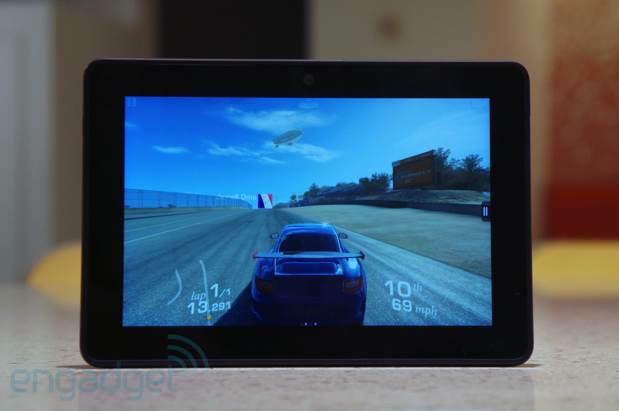 Of course, the Fire still has a ways to go in title selection if it's going to become a gaming powerhouse, though perhaps Amazon's embrace of higher-end GPUs will help convince developers to spend a little extra time porting their offerings over to the Fire. Web pages load in a snap, as well, thanks in no small part to the heavy lifting being done by the Silk browser. The browser also gave us a little benchmarking insight, via SunSpider. The HDX notched an impressive 553.7ms on the test, besting last year's score of 1,767ms and edging out the Nexus 7's 602ms (lower numbers are better here). It also bodes well for the Fire's app selection that we've found another benchmarking tool this time; the lack of testing options had previously made it more difficult to compare the device against more traditional Android offerings. It bodes well for performance too: the HDX managed an impressive 19,655 running the Fire version of Quadrant 2.1.1. Otherwise, however, we're stuck with anecdotal evidence on this front. And anecdotally, this is a pretty snappy little tablet. 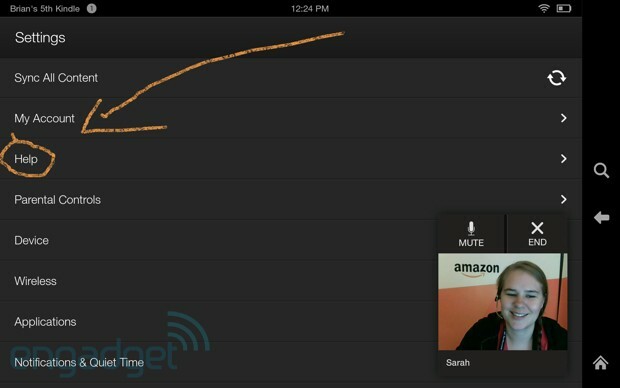 In spite of a slimmer profile, Amazon's actually managed to up the ante for battery life. The company claims a full 11 hours with standard usage, the same as last year. And you know what? We actually came close to that, eking out 10 hours and 41 minutes. That's 44 minutes more than the HD managed, and it's nearly three and a half hours more than what we got with the Nexus 7. That should keep you going through nearly a full season of your favorite sitcom. And if you enable Amazon's Reading Mode, which shuts down extra processes while you're reading, you should get around 17 hours of life, according to Amazon. Sure, it's nowhere near e-reader territory, but not too shabby for a full-color tablet. It's hard to say why Amazon waited for its third iteration to finally give Fire OS an official name. Perhaps it's an acknowledgement that even casual users are savvy enough to pay attention to operating systems these days, or maybe the company feels that the software is finally mature enough to be spoken about in the same breath as iOS and Android. It's perhaps slightly disingenuous to refer to Fire OS as an operating system, of course -- scrape back enough layers and you'd find Jelly Bean underneath. That said, this is much more than a TouchWiz-like skin. 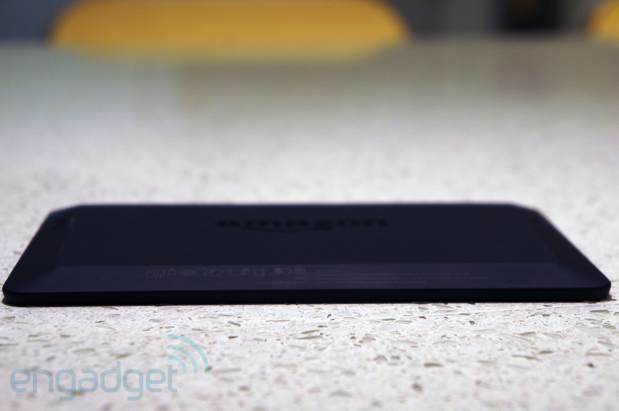 In fact, Amazon's done so much to the Android base so as to render it unrecognizable. And while the software is, as ever, a reflection of the company's laser-like focus on content delivery, a number of upgrades have helped the Fire continue to stand out in a seemingly endless parade of Android slates. At first glance, Fire OS 3.0 (codenamed Mojito, in keeping with the sugary goodness of Jelly Bean) bears a striking resemblance to earlier versions. Understandably so. After all, if the goal here was to provide a user-friendly experience for casual users, a full refresh would be pretty counterproductive. The centerpiece is, as ever, the content carousel, a swipeable river that offers up movies, albums, apps, books and the like, in order of the last time you opened them. At the top is a toolbar featuring a search icon and links to specific content categories. 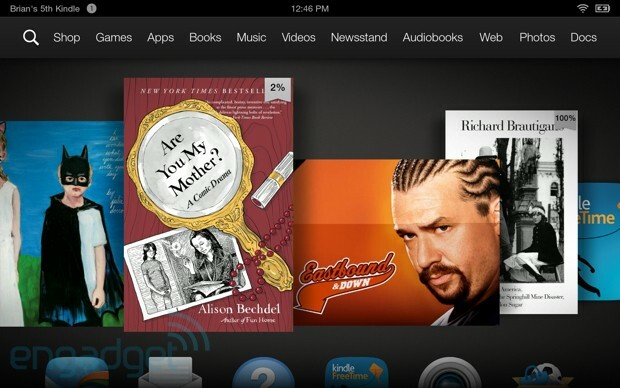 Users familiar with past iterations of Fire OS will notice a key difference on this home page. Peeking out just below the carousel are the tops of six icons. Swipe up and you'll find a grid of apps. 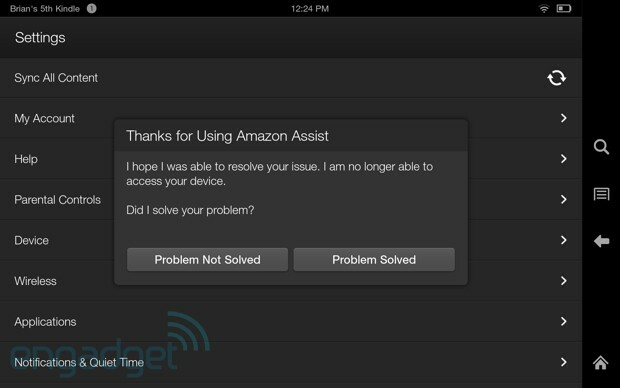 Yep, Amazon caved responded to user feedback, adding a more familiar mobile OS app layout directly to the front page. A swipe from off the right side of the screen while open to one of the media types, meanwhile, will bring up Quick Switch, a scrollable river of content that lets you quickly move between recently used media. As ever, there's no Play Store access here. Amazon's unquestionably got enough to offer in the way of movies, music and (especially) books. But while the app store is certainly growing (and will no doubt continue to do so as long as the Fire comprises a third of the Android tablet market), it still pales in comparison to the selection you'll find on Android and iOS. Still, the company is talking up support for HTML5 apps and the ease with which developers can port titles over from Android. Amazon does offer up a number of high-profile apps already though, which may prove more than sufficient for many casual users. 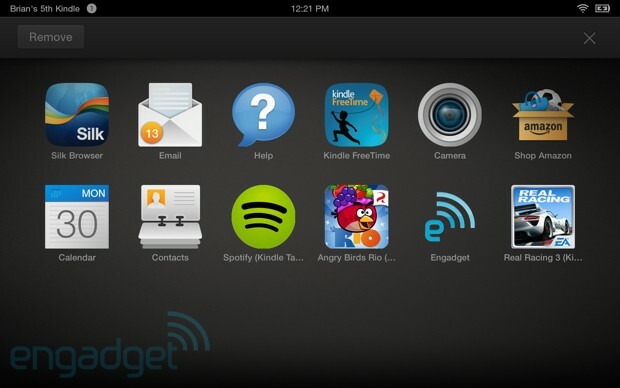 The biggest addition to Fire OS, however, is unquestionably the new Mayday button. In fact, Bezos was so excited about the new feature that he listed it as the "third leg" of the company's device strategy, alongside "premium products at non-premium prices," and that spiel about making money when people actually start using the devices. Swipe down from the top of the home screen or in an app like Books and you'll get a handful of quick settings options -- locking, brightness, wireless and Quiet Time, which lets you turn off notifications across the system or in particular content types like books and movies. To the right of all these is a small life preserver icon labeled "Mayday." Essentially, this is built-in video chat with customer support. Tap it and a video box pops up featuring a real, live human on the other end. Rest assured: while you can see them, they can't see you, so there's no need to put those pants back on -- and for their part, they don't have a work environment akin to Chatroulette. They can, however, see your screen. (Like most of these help sessions, there's some fine print letting you know that the conversation may be recorded.) The assistant on the other end can also take control remotely or, if you prefer, walk you through step by step, so you can do it on your own next time. They're also able to draw yellow arrows and circles, à la Monday Night Football, to highlight particular buttons and functions on the screen. The service gives you access to Amazon's support staff 24 hours a day, 365 days a year, and the company plans on hiring even more folks, in the hopes of bringing average response times down to 15 seconds. During our trial, it took a bit closer to 20, but Mayday is understandably short-staffed ahead of the HDX's launch. The real test will come, as Bezos pointed out, on Christmas Day, when new Kindle owners attempt to wrap their brains around the new device, or just want to show the new feature off to friends. To be honest, we found talking to a floating support head a little awkward initially, and we caught ourselves gesturing to the person on the other end, even though they clearly couldn't see us. It did get a bit more comfortable during subsequent trials, though we found ourselves grasping at straws for things to ask ("How do I turn on Quiet Time in reading?" "How do I check my remaining battery life?"). Sometimes, however, you just have to accept that a certain feature isn't necessarily for you. If you're the sort who tends to feel savvy with devices fresh out of the box, or if you like to tinker around until you answer the question yourself, you're probably not going to get a lot of mileage out of Mayday. And then there's that age-old service line irony: if you need help turning the device on, getting connected to the internet or launching Mayday, well, you're out of luck here. For all the tech-illiterate relatives who find themselves in possession of a Fire, however, the feature could be the lifesaver its name implies, from questions about locating the download folder (easier said than done) to getting app recommendations. Mayday may take much of the tech support burden off of those who buy the gadget for their loved ones. There's also plenty of opportunity for pranks, but well, that's part of the fun of new technology, right? The feature lets you "fling" content to your TV. What actually happens is that your set picks up the stream where you left off on your Fire, pulling video from the cloud and therefore not relying on the HDX for any processing power. You can also just pick up and leave the room with Fire in hand and the stream on the set will remain unaffected. Your tablet, meanwhile, is freed up for other things, be it checking your email or playing a game. If you're the sort who likes to actually pay at least half-attention to the TV while you're in the same room, you can also follow along using X-Ray, which offers up contextual information about actors as they pop up. That feature has also been expanded to include information about songs and trivia from Amazon-owned IMDb. Once you're done, you can fling that content right back to your tablet. Second Screen is a cool feature, certainly, and it's a clever way of leveraging the foundation the company has been laying down with X-Ray. There are, not surprisingly, a few moments of buffering as videos jump from one device to the other via the cloud, but otherwise it works fairly well, and certainly makes X-Ray a lot more usable than attempting to split a 7-inch screen between a video and that feature. Still, it's a shame that Amazon opted not to include a wired video-out option on the HDX, an omission that may turn off some users. Mojito sees further expansion of X-Ray, as well. The feature now has a musical component, which offers up karaoke-like lyrics on the right side of the screen as you play music from your library or the cloud. As the company noted at the launch event, these are the officially licensed lyrics, not the crowd-sourced variety, so you're getting the words the artists put to paper, as inane or insightful as they may be. And while we were assured that the functionality would be rolled out to most of what Amazon offers through its music store, the lyrical offerings are still pretty few and far between at the moment. In fact, we came up short even with well-known artists like David Bowie. Along with numerous new entertainment offerings, Amazon also took the opportunity to add some enterprise features, in an attempt to embrace the ever-growing segment of people who bring their personal devices to work. The most forward-facing results are improvements to the email client, including, thankfully, threaded messaging -- a particularly nice feature given the absence of a first-party Gmail app. The HDX also supports wireless printers for documents, hardware data encryption, a native VPN client and support for enterprise solutions like Citrix. FreeTime, meanwhile, addresses increased device usage amongst young'uns. Enter a password and create an account for all the little ones in your abode, and you can relegate their usage to specific apps, books and other content. 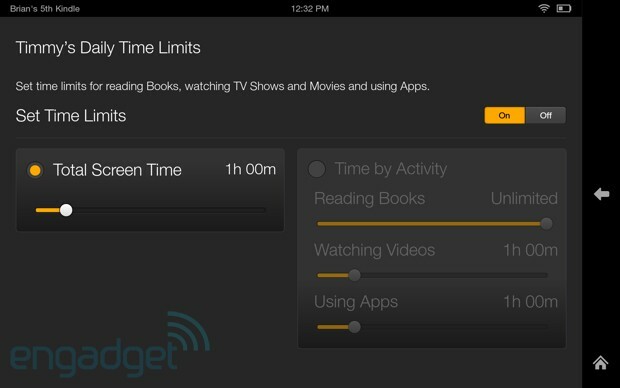 You can also set daily time limits, so they don't spend too much time in front of the tablet. This can be broken down on a content-by-content basis, so they can, say, spend all the time they want reading, but only get an hour or two of movie-watching a day. The feature isn't particularly groundbreaking in terms of parental control, but it makes a strong argument for shared devices, versus kid-specific tablets like ones from Samsung and OLPC. As with the Paperwhite, Goodreads functionality will be baked into the software eventually. The Amazon-owned social reading service will arrive as part of a 3.1 update, set to roll out in mid-November. With it will come the ability to see what friends are reading, write reviews, share excerpts and get better-tailored recommendations, the latter of which has been sorely lacking from Amazon's e-book offerings. Obviously, we'll have to wait for the final feature to arrive before we're ready to give a deep dive. In the meantime, some social features have been added to Fire OS 3.0, letting you share content via Facebook and Twitter. 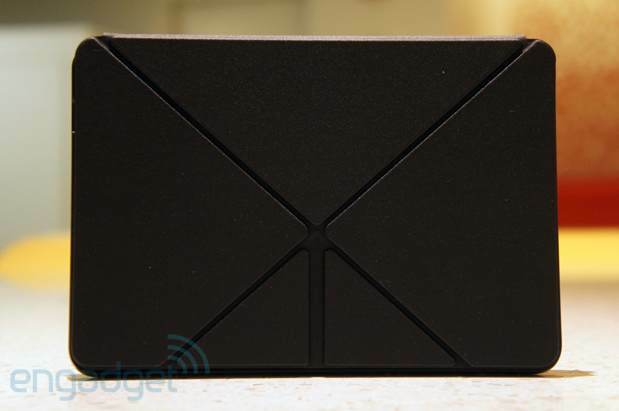 Bezos seemed nearly as excited about the HDX's Origami cover as the tablet itself. Granted, it's not quite as rousing as a new Fire, but we've got to say, it really did enhance our enjoyment of the device. The case attaches magnetically to the HDX (there are also covers for the 9-inch version and the revamped HD), offering a hard backing and a soft cover that flips over. The back of the case has buttons for power and volume, and when the front cover is flipped back, audio from the speaker grilles comes out of the top, with the sound directed a bit closer to the user than normal. The front, meanwhile, has a number of creases that give the Origami its name. Fold them up and they attach to each other magnetically, turning the case into a stand that works in both landscape and portrait modes. You can also reposition it so the tablet will stand at different angles. If the Surface has taught us anything, it's that proprietary cases highlight how a manufacturer expects its devices to be used. In the case of Microsoft's tablet, the primary function is supposed to be productivity. Here, it's content consumption: the Origami case gives you a viewing stand for your Fire you can take with you everywhere. The case comes in five colors and two materials: polyurethane and leather, which will run you $50 and $65, respectively. Not cheap, but definitely recommended for the full experience. If the Origami case doesn't strike your fancy, there's no lack of third-party options. OtterBox is offering up an HDX-specific Defender case, for those who plan on bringing their Kindle Fire with them to the battlefield. That will run you nearly $70. Marware and Belkin, meanwhile, are each selling more affordable options. 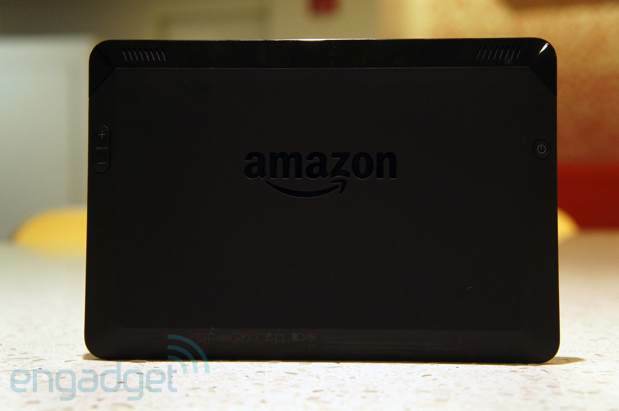 Amazon continues to step up its game (and its prices) with the Kindle Fire line. Still, despite a $20 price increase, $229 doesn't seem like a lot to ask for a device like this. From the 1,920 x 1,200 (323-ppi) display to the 2.2GHz quad-core chip inside, there's nothing about this slate that screams budget. Granted, if you want to pay the lowest price possible, you're going to have to turn screen space over to advertisements in the form of Special Offers, or else shell out $15 to banish them from your device. And, of course, LTE will cost you even more. The software continues to be somewhat limiting for power users, due to a content-based UI and a lack of Google Play access, but Amazon has sprinkled in plenty of new features, including Mayday, Second Screen, a grid layout and additional X-Ray functionality. If you're searching for that perfect starter tablet for a loved one, the HDX is a compelling proposition with plenty of user-friendly features and specs that match the Nexus 7 blow for blow. Looks like it's going to be another Merry Christmas for Amazon's hardware division.